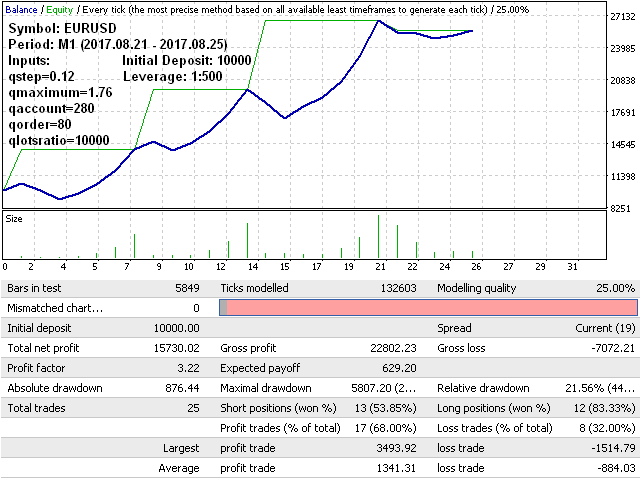 QAdvisorSAR MT4 is a robot for Forex trading. The Parabolic Stop and Reverse indicator is used to calculate the direction of the first trade. If the trade becomes profitable, it is closed and the cycle is restarted. If the trade becomes unprofitable, then the robot gradually opens a grid of orders with Martingale-based volumes. Once the grid becomes profitable, it is closed, and the cycle is restarted. In order to stop QAdvisorSAR MT4 after closing the current grid of trades, it is necessary to create a global variable named "stop". qmagic = 57659 - magic number. qstep = 0.02 - step to change the price of the Parabolic Stop and Reverse indicator, which is used for opening the first trade. For optimization, set values from 0.02 to 0.2 with a step of 0.002.
qmaximum = 0.2 - the maximum step of the Parabolic Stop and Reverse indicator. For optimization, set values from 0.2 to 2.0 with a step of 0.02.
qaccount = 100 - the total profit in points to close the trades. For optimization, set values from 10 to 1000 with a step of 10.
qorder = 100 - profit or loss of a trade to open the next trade. For optimization, set values from 10 to 1000 with a step of 10.
qlotsratio = 10000 - ratio of the balance to the volume of the next trade in lots. - Optimal default values for input parameters. - Closing only its own deals with the qmagic magic number. - Adjustment of trade volumes.